The abbey at Sallay (Sawley) was a Cistercian house founded in 1147/8 by the Percys, close to the Yorkshire-Lancashire border. 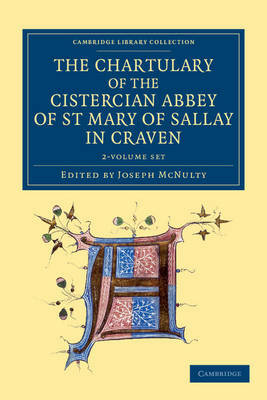 The chartulary was compiled in the 1330s, comprising records from the foundation onwards, with a few later additions. The house remained a poor foundation, and it suffered when Whalley Abbey was founded only seven miles away in 1296. The 676 charters are arranged in twelve geographical groups, according to the proximity of the properties to Sallay. The documents are given in Latin, with English summaries of each by the editor, Joseph McNulty, who has also attempted to date the charters. Although the abbey is not as well known as other foundations, its charters provide a valuable source for the economic history of the north of England. Volume 1, published in 1933, contains charters 1-388. Volume 2, published in 1934, contains charters 389-676 as well as a previously unknown mid-fourteenth-century valuation of Yorkshire churches.